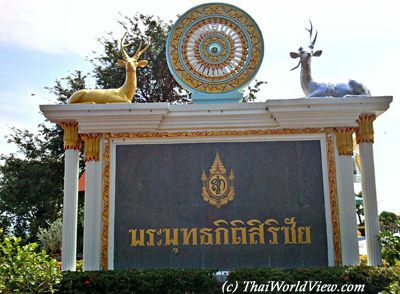 The coastal strip between Bangkok and Chumphon includes nice areas including Prachuap Khiri Khan and Bang Saphan. 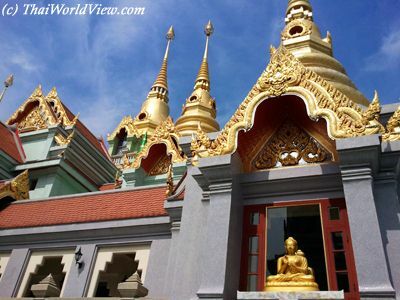 Tongchai hill (เขาธงชัย) offers great panorama over Bang Saphan beaches and features a huge Buddha image and stupa. 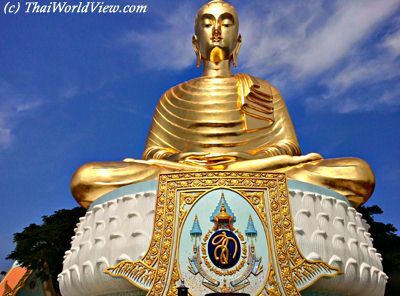 Phra Phu Takitti Siri Chai (พระพุทธกิติสิริชัย) is a Buddha image in a meditating pose. 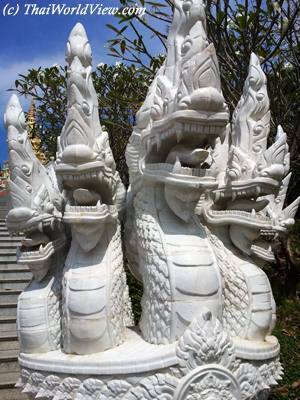 Phra Phu Takitti Siri Chai is 12 meters wide and 10 meters high. 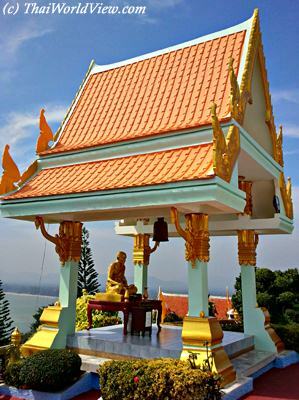 It is located on the top of Tongchai hill. 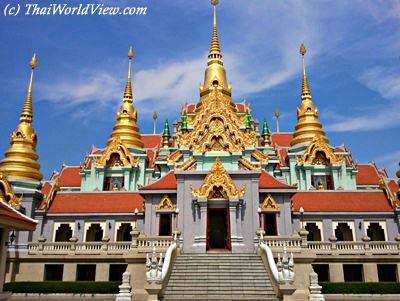 The Buddha image is facing the sea and was built for the Thai Queen Sirikit's 60th birthday. 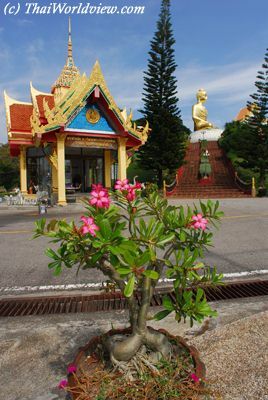 Phra Mahathat Chedi Phakdi Prakat or พระมหาธาตุเจดีย์ภักดีประกาศ is a big beautiful stupa on the same hill as Pra Phu Takitti Siri Chai Buddha image. 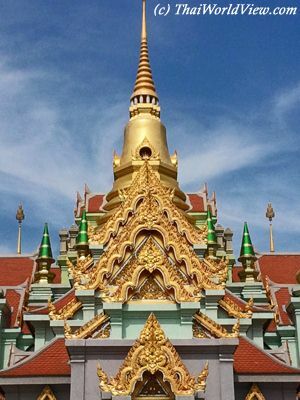 Phra Mahathat Chedi Phakdi Prakat was built for Rama IX golden jubilee to celebrate the 50th birthday of Rama IX being King of Thailand. 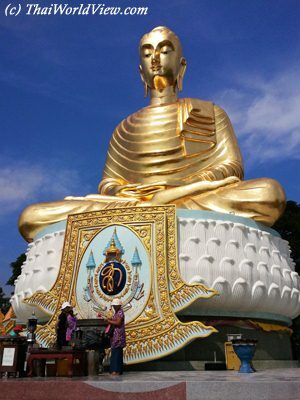 This big Buddha image and impressive "Phra Mahathat Chedi Phakdi Prakat" stupa are part of Unseen Thailand tourist treasures. 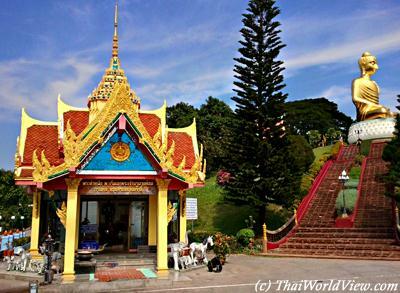 Kromluang Chumpon Ket-Udomsak or ตำนักกรมหลวงชุมพร เขตอุดมมศักติ์ pavillion is also located on Thongchai hill. Kromluang Chumpon Ket-Udomsak was son of Rama V and father of Thai navy. 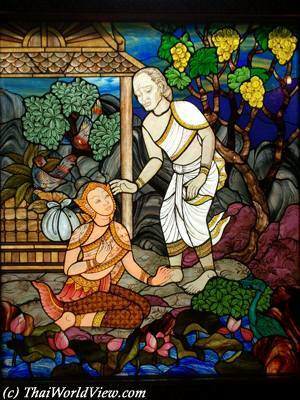 Phra Mahathat Chedi Phakdi Prakat features beautiful and colorful stained glass windows. 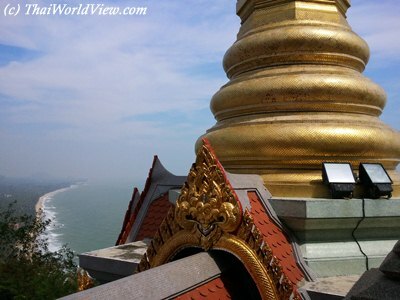 From the top of Phra Mahathat Chedi Phakdi Prakat, gorgeous views over Baan Krut beaches can be enjoyed. 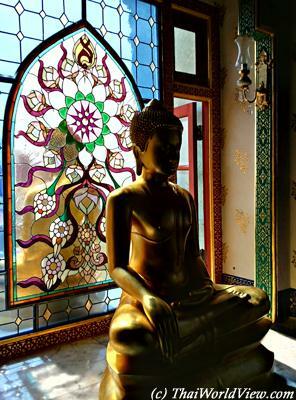 Phra Mahathat Chedi Phakdi Prakat features big and small Buddha statues on the first floor. 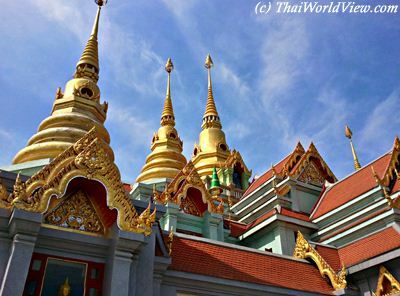 Under a blue sky and strong sun, Phra Mahathat Chedi Phakdi Prakat is glittering in all directions. 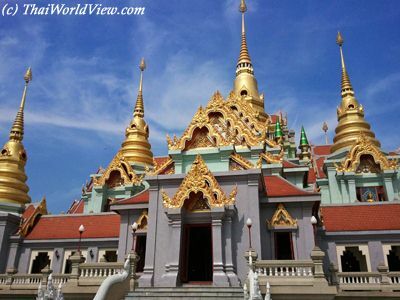 Phra Mahathat Chedi Phakdi Prakat is a stunning and impressive place to visit in Bang Saphan area.